HRH The Princess Royal visited the NTFC Education Centre in St Crispins today. A class of teenagers who are earning their BTECs with the Cobblers enjoyed a royal visit today. HRH Princess Anne was flown in by helicopter this afternoon (September 21) to see students at the Northampton Town FC Education Centre, in St Crispins. The princess arrived by helicopter onto one of the centre's two and a half designated football fields. The Princess Royal was invited to formally open the sports and learning centre by unveiling a plaque and watching a coaching session. It comes after the £2million centre in St Crispins started term two weeks ago, and marks its first full year in operation. HRH Princess Anne said: "It's so good to see a local football club using their place in their community to make such an impact on young people's lives." The NTFC education Centre aims to give students a boost in education and hone their football skills to give them a better chance at university, work placements and even scholarships with soccer teams in America. The Princess spoke with students who are earning with BTEC in Sports Excellence. The princess's helicopter landed on one of the centre's two-and-a-half dedicated football fields before the royal guests spoke to students, unveiled the plaque and watched a boys' team coaching session. One pupil, Tiya Johnson, 16, who started at the centre two weeks ago, said: "We're told it's all about education first and the football comes after. But my favourite bit is the sports. We play two hours a day. "I want to earn a scholarship and get a contract with a team in America." Head of education Jean Limpitlaw, said: "We're most proud of is that we treat each young person as an individual. We want to find their strengths and help them find their own pathway for who they want to be. "I felt that someone like Princess Anne who has such a background in sports would understand the power of sports and the pressures that can come with juggling training and education." 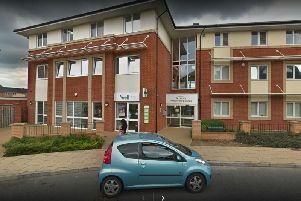 The scheme is in its seventh year and moved into the St Crispin's centre last year. It also runs out of a campus at the PTS Academy.